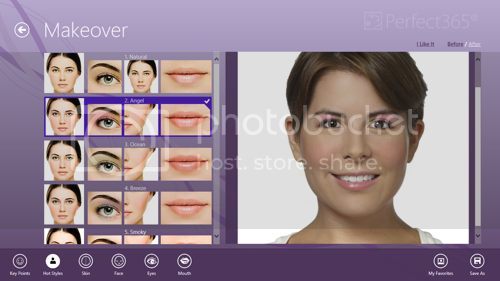 If you are looking for a photo retouching app for Windows 8, Perfect365 is the one you shouldn’t miss. Notice that this is not a professional program like Adobe Photoshop, Perfect365 is a simpler and much easier to use app. You could still be surprised with the final result as your imagination and patience could lead to the perfect combination of make-overs. The app is free and you can download the free Perfect365 Windows 8 app or the Perfect365 iPhone app. It is developed by ArcSoft. The Home screen allows you to choose your photo, capture with camera or choose from favourites or their samples. The app can handle photo with one face only. Its face-detection component works amazingly as it automatically detects eyes, nose, cheeks and mouth regions. Of course, you can manually change the key points if there is any mistake. You now can start your makeover with the underneath bar including Key Points, Hot Styles, Skin, Face, Eye and Mouth. The app also offers the one-tap touch-up and makeover that you can apply some preset makeup templates in 1 click. 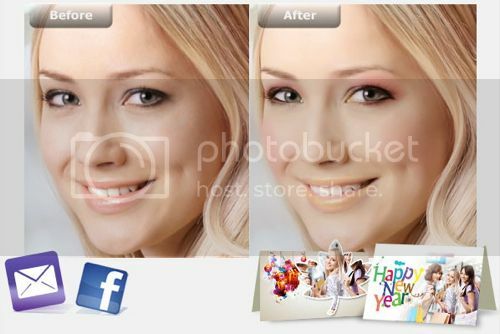 You can continue doing the retouch manually if the result hasn’t satisfied your needs yet. For example, you can remove blemishes, apply blush, slim the face, blur the skin, adjust smile indensity, bright up your teeth, etc. You can compare before and after at any point using the app. In general, the Perfect 365 is a great choice for girls who don’t know how to use the compliated Adobe Photoshop. It will take them just a few minute to retouch their portraits, and use it as a new profile picture on Facebook and Twitter. That’s all girls require in a retouching app. That’s really cool! You’re right, I will definitely have to try that out on some pictures, thanks.